While in New Zealand, Alain Bertaud, a Senior Research Scholar at the NYU Stern Urbanization Project, spoke with Radio New Zealand about housing affordability, which was a hot topic during their recent general election. In Auckland, for example, the ratio of median income to median home price is around 8, which is very high by world standards (see graph in the first figure). High residential prices are the result of government land use restrictions, and to make housing more affordable the government should remove these restrictions. What is surprising about housing affordability issues in New Zealand is that housing prices are very high relative to income despite the country’s very low population density. New Zealand and the UK are roughly the same size, but New Zealand has a population of 4.5 million people whereas the UK has 64 million people. This presents a puzzle: why should the housing price-income ratio be so high in a country with an abundance of land, sound financial institutions, and a reputation for excellent governance? 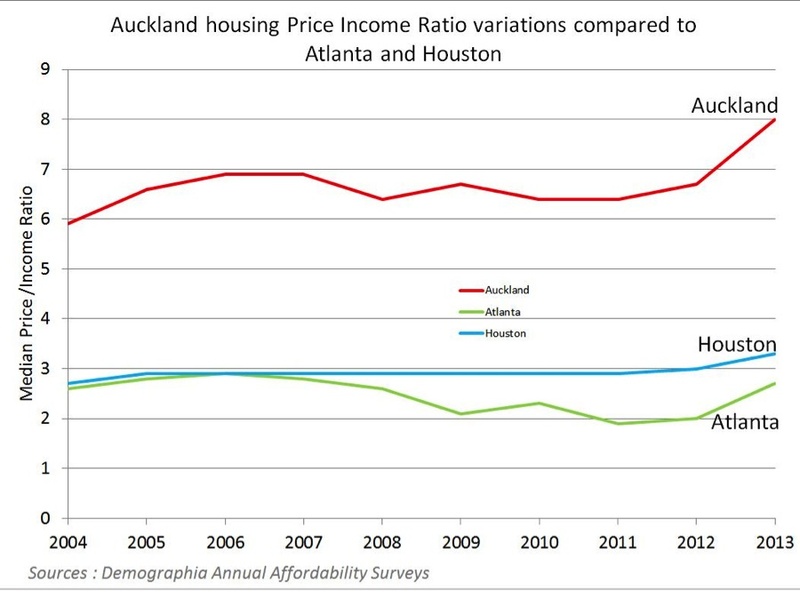 The graph above compares the changes in housing price-income ratio between Auckland, Atlanta and Houston. These last two cities are well known for low regulatory barriers and topographical constraints. Topography explains part of the difference. 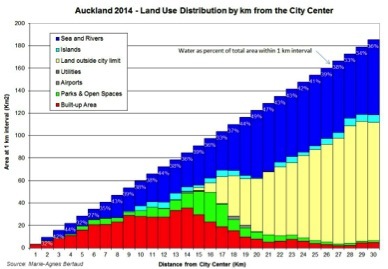 Water in Auckland somewhat restricts the supply of land, which increases land prices. Other New Zealand cities also have topographical constraints, such as Wellington’s mountains and water. So a part of this difference is due to topography. A more important cause of the difference, however, is New Zealand’s building regulations and poor land use policy compared with the light regulatory constraints in Houston and Atlanta. Marie-Agnes Bertaud prepared the land use and density analysis presented here. First, let’s look at the topographical constraint that may restrict land supply and consequently contribute to higher housing prices. The maps presented in the next figure show the large areas of water that restrict the buildable areas at various distances from the city center. The total area of water per kilometer from the city center is shown in the graph below. We can then quantify Auckland’s topographical constraint: 39% of the area within a circle of 30 kilometers from the city center is occupied by water. 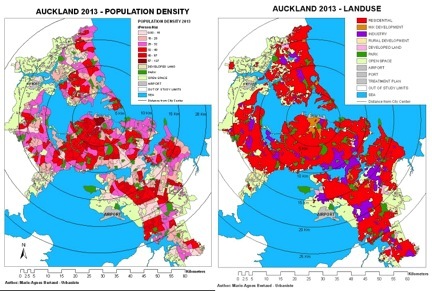 This topographical constraint on land supply in Auckland is severe, but New Zealand’s government has exacerbated the problem by restricting land use. An Urban Growth Boundary called the Metropolitan Limit confines the expansion of the city beyond the existing built-up area (in red on the graph of the above graph). This regulatory constraint, added on top of the natural constraint imposed by topography, explains the exceptionally high housing price-income ratio of Auckland. The limit imposed on the horizontal expansion of the city in green fields encourages increases in residential prices. As demand for new housing increases, no new land supply can enter the market and act as a release valve for this increased demand. 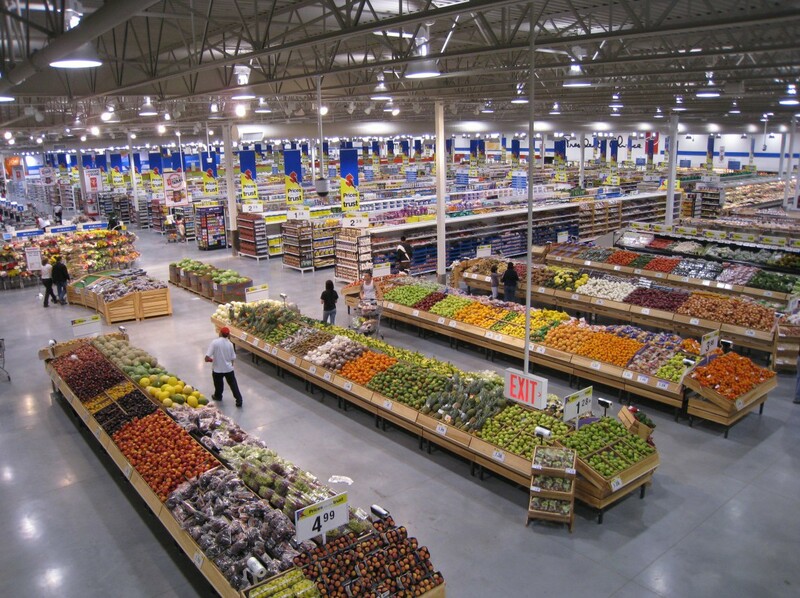 Existing supply must fulfill all of the higher demand, resulting in much higher prices. 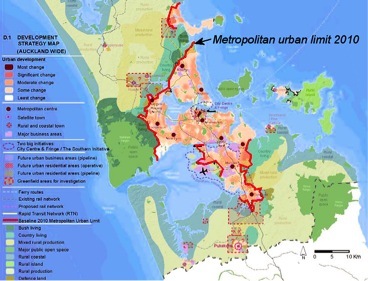 Auckland planners thought that imposing a tight urban growth boundary would create a “compact city,” in which new dwelling units would be provided through densification of the existing built-up area. They thought that this urban form would be more efficient in terms of transport and would benefit the environment. However, the process of densification, if it occurs at all, is bound to be very slow in a highly regulated city. Many areas close to the city center where densification is more likely to respond to housing demand remain constrained by both height regulations, which are only being removed piecemeal, and grassroots activists, who are often for densification in theory but not when it occurs in their own backyard (Not-In-My-BackYard or “NIMBY”). In these circumstances, an increase in housing demand is bound to increase housing prices, as a new housing supply that relies nearly entirely on densification is highly inelastic. Furthermore, as income increases, demand for residential floor space per capita also increases. So higher floor space densities – taller buildings – will not necessarily translate into higher residential densities. See, for example, decreasing Manhattan residential densities even as building heights in Manhattan soared. 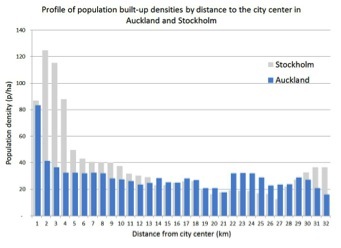 Auckland’s density profile compared to Stockholm, a city with an equivalent population and topographical constraint, shows that there is indeed a potential for densification in areas within about 12 kilometers from the city center. The profile of Auckland population density, shown in the figure below, is practically flat outside the area within one kilometer of the city center. Market forces free of height regulations might have created a density profile similar to Stockholm, where densities decrease slowly from the center outward. While these two measures should be used simultaneously to increase housing supply, faster and greater impact would come from making more land available to developers. Increasing the housing supply through densification is always slow due to the need to change legislation, NIMBYism, from adjacent residents, the cost of relocating existing land use or occupants, and the increasing demand for floor space per capita. In the interview with Radio New Zealand, Bertaud said that the lack of affordable housing has serious social costs because it creates a transfer of wealth to older property owners, who own houses with increasing price tags, from younger owners, who have to purchase housing at inflated prices. It also makes it more difficult for employers to attract employees without increasing salaries to account for high housing costs. Employees and sometimes employers are then incentivized to emigrate to do business in an area with lower costs. New Zealanders are rightly concerned about maintaining the natural beauty of their country. 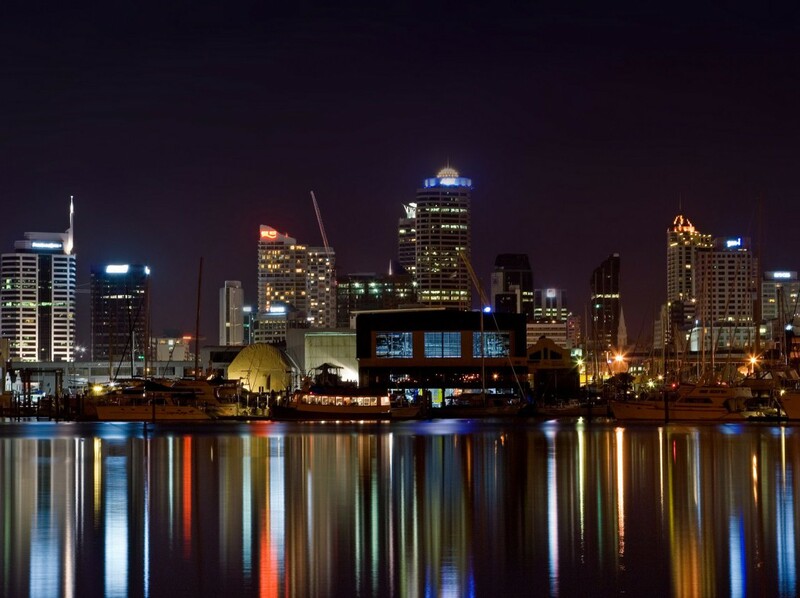 However,with urban land only constituting 0.8% of all land in New Zealand, its cities have plenty of room to expand and give residents of all income levels access to the benefits of urban life. Tile image courtesy of Steve Arnold.